This was the work that finally put Donizetti on the map. Having already produced over thirty operas in Italy, he suddenly became famous across Europe after the first performance in Milan on 26 December 1830. The first Anna was the amazing soprano Giuditta Pasta, who less than three months later created the role of Amina in La Sonnambula, and exactly one year later on 26 December 1831, the role of Norma, all in Milan. Italian operas in what later became known as the bel canto style were all the rage at the time, but they went out of fashion in the late nineteenth century, and a serious revival had to wait until after the Second World War. By that time Anna Bolena was a forgotten work. It needed a great soprano, and when Maria Callas raised the possibility of reviving it at the Met, Rudolf Bing dismissed it as “an old bore of an opera”. Fortunately La Scala was willing, and with Visconti as producer, Gavazzeni in the orchestra pit, and Callas in the main role, it was a huge success — the live recording was issued by EMI. 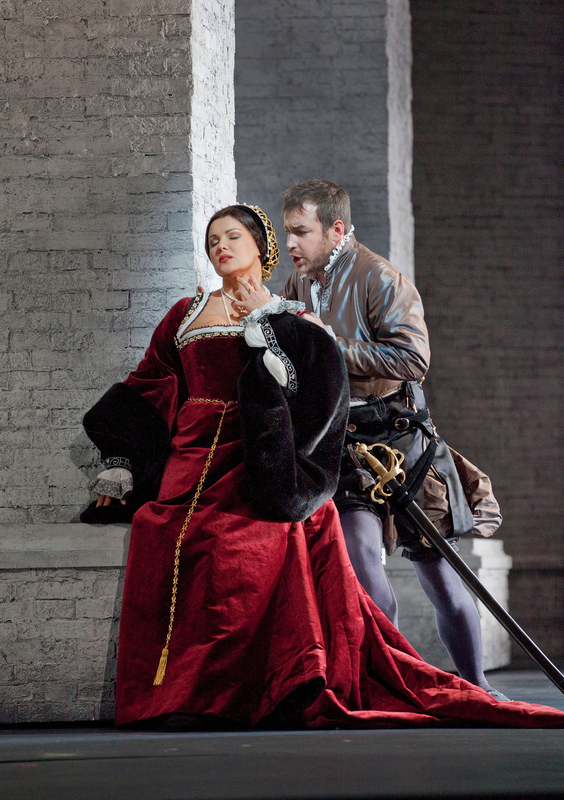 Now we have Anna Netrebko as Anne Boleyn, and what a queen she is. Sincere, emotional, and not to be trifled with, though that’s exactly what her husband Henry VIII does, setting her up to sweep her aside in favour of her lady-in-waiting, Jane Seymour. After all the emotion of meeting her previous lover Percy she is still ready to give a powerful rendering to “Ah! segnata è la mia sorte” (Ah, my fate is sealed) at the end of Act I, seeing the prospect of her accuser (the king) being the one who condemns her. 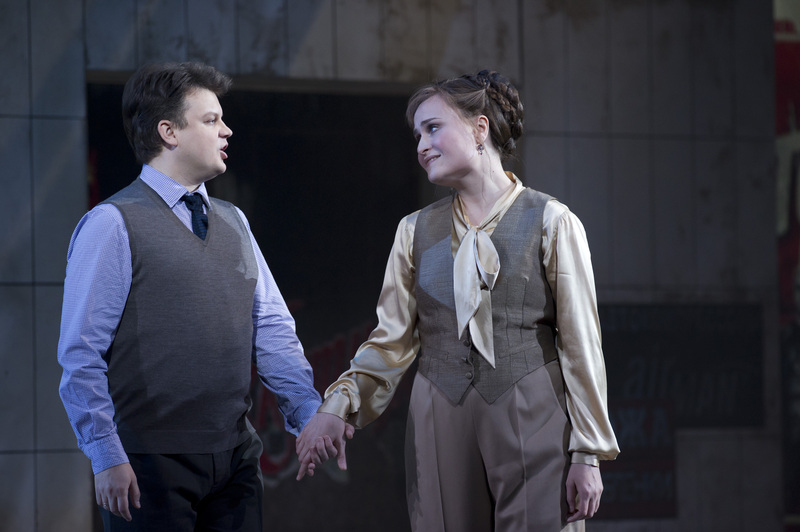 Percy was brilliantly sung by Stephen Costello, his high tenor having a heroic timbre, and the wretched Smeton (Mark Smeaton), a twenty-four year old musician who is secretly in love with the queen, was convincingly portrayed by Tamara Mumford. As for the king himself, Ildar Abdrazekov sang this bass role with excellent gravitas, and demonstrated power and cunning in equal measure. 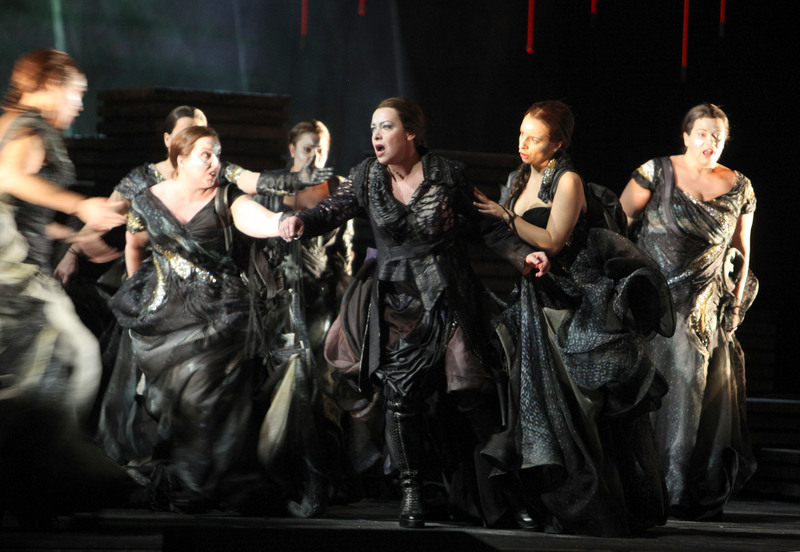 The role of Jane (Giovanna) Seymour was sung by Ekaterina Gubanova, whose voice was quite different from Ms. Netrebko, and the Met did well to produce such a strong contrast. 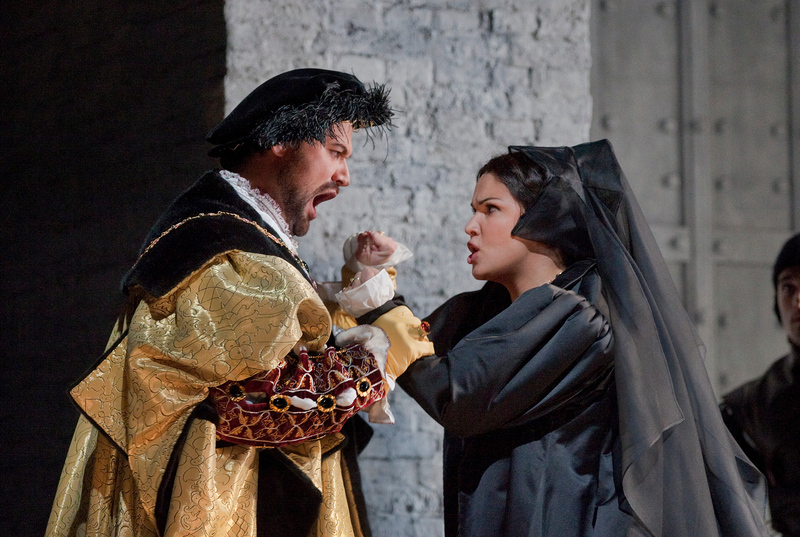 In Act II it only got better, and Anna Netrebko came through with the emotions every time. So sincere in her soliloquy as she sings of how Catherine of Aragon was wronged, yet suddenly when Jane Seymour tells her she can save her own life by admitting guilt, she is furious, easily winning the exchange between the two women while not yet knowing that Jane is her rival in the king’s affections. The nobility of Anne and Percy shone through in the sincerity of their singing, and it’s hard not to feel that Henry VIII was a rogue, but then … he was an immensely powerful monarch, and David McVicar’s production emphasises this very well. In Act I as Percy returns from exile at the king’s wish, and bends to kiss the monarch’s hand he whips it away at the last minute. Details like this help create a convincing atmosphere for this historical tale of two of the six wives of Henry VIII. For those unfamiliar with the list, just remember: divorced, beheaded, died; divorced, beheaded, survived. Anne Boleyn was beheaded and Jane Seymour later died after giving birth to the king’s only son, the future Edward VI. Musically this was a wonderful team effort with Marco Armiliato in the orchestra pit, but it was of course Anna Netrebko who gave it the diva touch. Congratulations to the Met for broadcasting it, and for extending their relays to Russia, which is highly appropriate in this case as the three main roles were sung by Russians! This is about love, jealousy, guilt and remorse — ideal material for opera — ostensibly set in the time of Ivan the Terrible (late Tudor period in England). The power of the oligarchs and the state security police (the oprichniki) is part of the story, and director Paul Curran, who has lived and worked in Russia, sets it all in modern times. The result carries complete conviction, allowing the human emotions, insecurities and scheming to shine through in a milieu that is easy for us to understand. Rimsky-Korsakov wrote this opera at the end of the nineteenth century, and made no attempt to follow what was becoming an academically Russian style. Quite the opposite in fact, and in Act I the young man Lïkov, who is in love with the heroine Marfa, sings a beautiful arioso commenting favourably on the way things are done in Germany. This is immediately countered by a chorus singing the glories of the Tsar, and dancing girls who entertain the oprichniki at a party given by Gryaznoy. He is also in love with Marfa, and his mistress Lyubasha is insanely jealous, to the extent that she asks the Tsar’s pharmacist Bomelius to give her a potion that will destroy Marfa’s beauty. Gryaznoy also acquires a potion — to make Marfa fall in love with him — and he gets her to drink it before her wedding to Lïkov. The Tsar himself we never see, but he’s in the process of choosing a wife, and his choice falls on Marfa. She, however, has taken the potion given her by Gryaznoy, and yet unbeknownst to him, Lyubasha has switched the potions. These multiple deceptions end in tragedy in the last Act, as Marfa, now the Tsarina, finds herself dying. 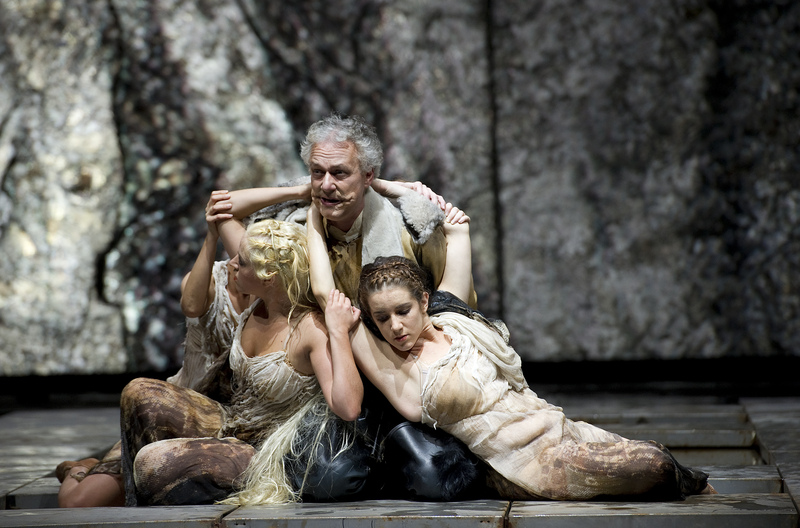 To cover himself, Gryaznoy has accused Lïkov and killed him, but as Marfa becomes delirious she believes Gryaznoy to be her beloved Lïkov, and he is overwhelmed by remorse. He admits to his crime, only to be outdone by the scheming Lyubasha, who realises she’s lost him. Death all round, but in the style of great opera we were rewarded with glorious singing. Marina Poplavskaya was a wonderful Marfa, so pure of tone and innocent looking. 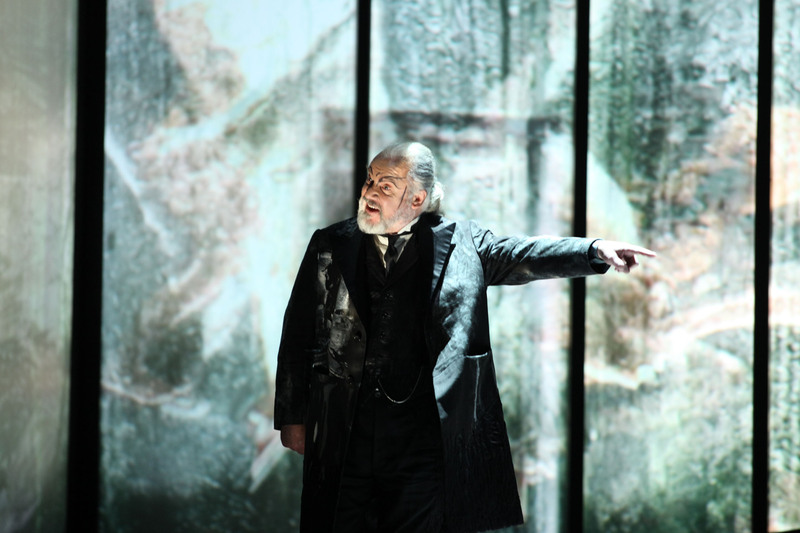 Johan Reuter portrayed a powerful Gryaznoy, and Dmytro Popov sang Lïkov with a lovely lilt to his tenor voice. The other fine tenor voice was Vasily Gorshkov as Bomelius the pharmacist. The bass role of Marfa’s father was well sung by Paata Burchuladze, and it was altogether a strong cast, with Ekaterina Gubanova singing powerfully as Lyubasha, particularly in her unaccompanied aria in Act I. The direction by Paul Curran was excellent producing well-nuanced and entirely convincing performances. Sets and costumes by Kevin Knight were superb, and I loved the women’s costumes in the Tsar’s palace for Act IV. The purples blended with the gold leaf in the background, and gave a perfection to what in fact is a frightful scene of madness and eventual death. 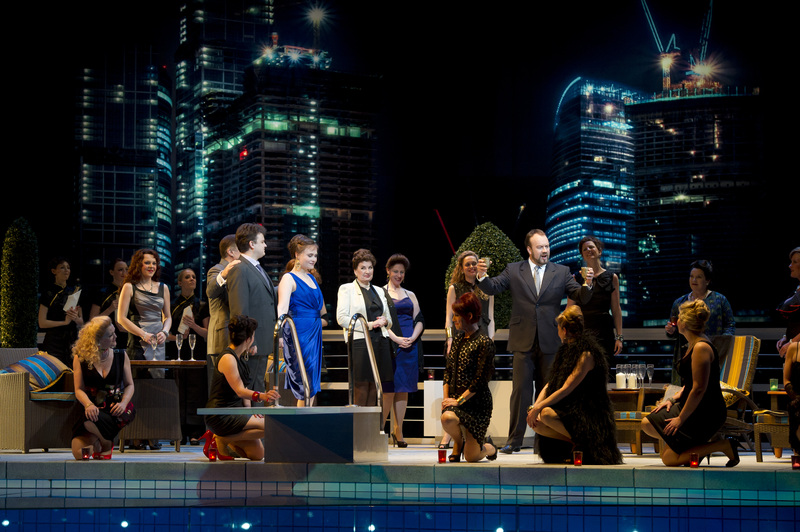 The set in Act III was simply fabulous, a penthouse with an outdoor pool, and the lighting by David Martin Jacques was remarkable. The bright skyscrapers in the distance, and the reflection of the pool on the upper facade of the balcony drew spontaneous applause from the audience. 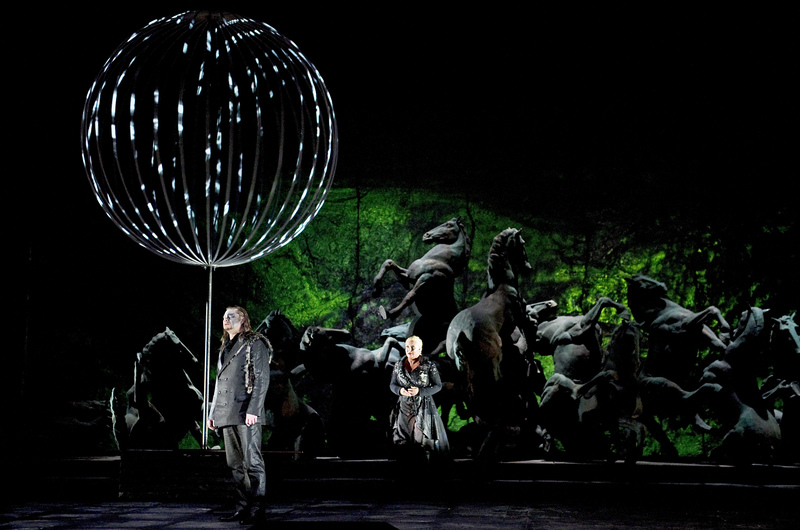 This opera is a favourite Rimsky-Korsakov work in Russia, yet little known in the West. The trouble is of course that recordings, and even scores, were not readily available until after the collapse of the Soviet Union, but we need to be seeing more of these works. Mark Elder did a terrific job with the orchestra, bringing the score to life, just as the production brought the story to life. For anyone who thinks this representation of Russia is over the top, and I met one such, read Adrian Mourby’s excellent essay in the programme. Yes, Russia looks entirely normal, but the abnormalities are associated with the oligarchs, and this is essentially the setting of The Tsar’s Bride. Performances continue until May 2 — for more details click here. The main character in this fascinating opera by Offenbach is Hoffmann himself, gloriously sung here by Joseph Calleja. He first appears in a tavern where the menacing Count Lindorf is determined to steal his lover, the opera singer Stella. Lindorf has stolen a letter from her to Hoffmann, who entertains the company by describing three earlier loves, Olympia, Antonia, and Giulietta, all of whom portray aspects of Stella. In the ensuing story, Lindorf first reappears as Coppelius, creator of Hoffmann’s first lover, the mechanical doll Olympia, brilliantly performed here by Kathleen Kim. His second transformation is as Dr. Miracle, overseeing the death of Hoffmann’s second lover Antonia, beautifully sung by Anna Netrebko. Miracle once oversaw the death of Antonia’s mother, and though banned from the house he manages to enter and persuade Antonia to sing. 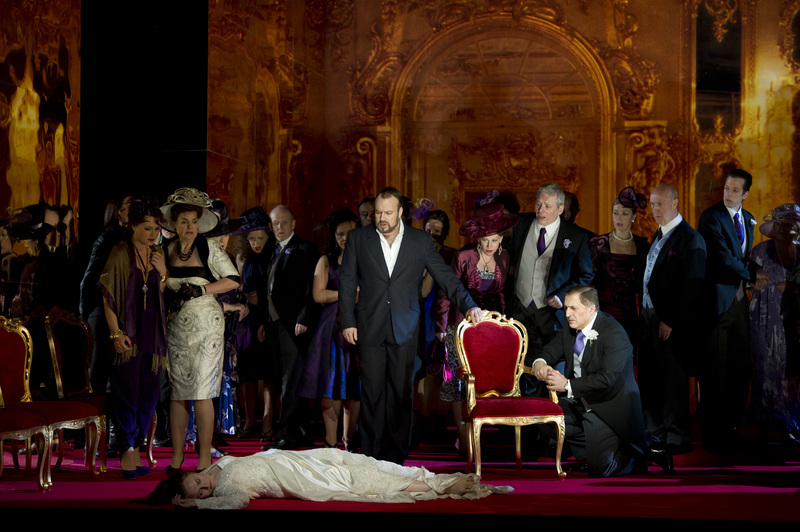 This leads to her death after she has just promised to marry Hoffmann. Lindorf’s third transformation is as Dappertutto, confidante to Hoffmann’s third lover, the courtesan Giulietta, who was sung by Ekaterina Gubanova. Dapertutto attempts to destroy Hoffmann by getting Giulietta to steal his image from a mirror, after which she disappears in a gondola. 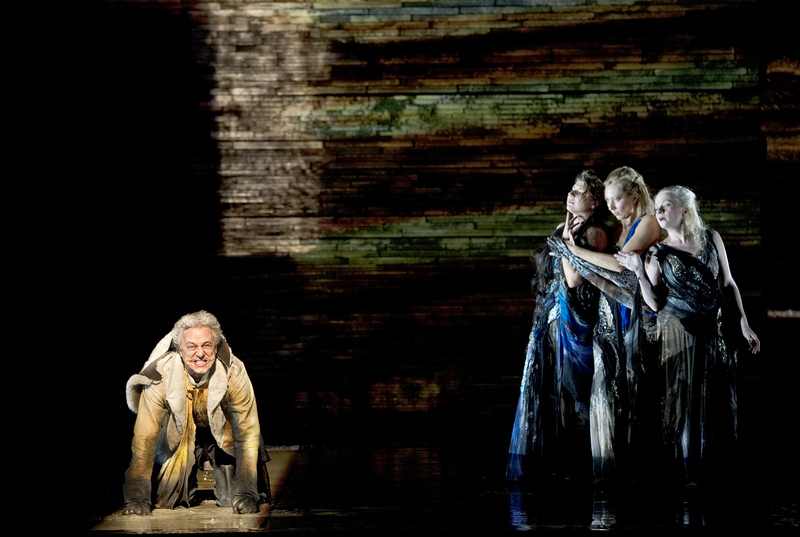 Hoffmann then finds himself back in the tavern where he loses Stella to Lindorf, leaving him to his muse and his drink. Lindorf and the three thaumaturges are one and the same, and were all excellently sung by Alan Held. He, Joseph Calleja, and his muse, sung by Kate Lindsey, were the driving forces behind this fine performance, well aided by James Levine in the orchestra pit. Alan Held’s presence was suitably dark, and Kate Lindsey was outstanding as both a beautiful muse and Hoffmann’s friend Nicklausse, who is mysteriously present throughout. They are powerful forces of despair and recovery for Hoffmann, and Joseph Calleja performed that difficult role with glorious singing and a sympathetic stage presence. This production by Bartlett Sher is powerful in its representation of the imagery behind Hoffmann’s passions, and is well aided by Michael Yeargan’s sets, Catherine Zuber’s costumes, and choreography by Dou Dou Huang. I particularly liked the fact that Hoffmann’s lovers were in the correct dramatic order, though so many other productions switch the order of Antonia and Giulietta. 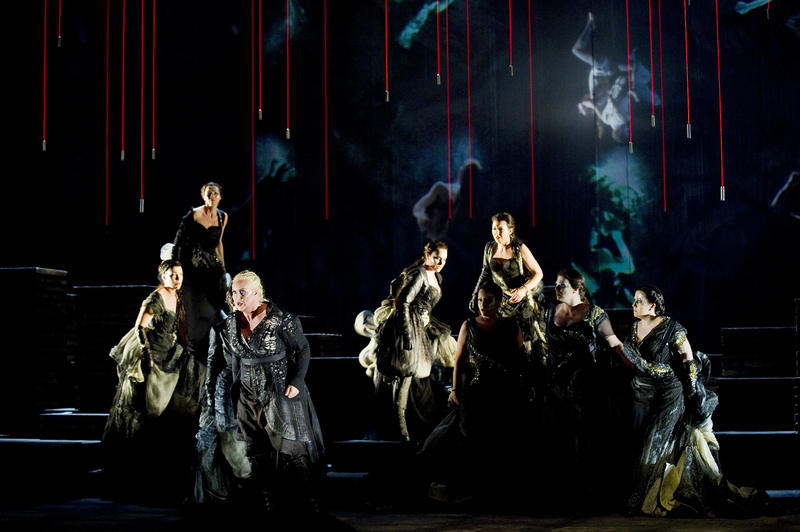 They do that because the producer finds the music for Antonia stronger than that for Giulietta, but the drama of the mirror in Giulietta’s scene is crucial because it allows the magus, alias Lindorf, to show Hoffmann that his image of himself is but an image that can be wiped out, leaving the poet to his muse and his companions. My only complaint with this production is that it lacks the ending of the Giulietta scene when she drinks poison prepared for Hoffmann, and Departutto cries out, Ah, Giulietta, maladroite! With this ending to the act, Hoffmann has destroyed all three representations of Stella and is ready to live again for his muse.